Traditional oatcakes, handmade using organic wheat and oats grown and milled on Pimhill Farm in Shrewsbury. The Mayhall family add organic salted butter and bake the oatcakes to crisp perfection in a woodfired oven. Buttery and nutty with a wholesome crunch, top them with one of our award-winning organic cheeses and a dollop of chutney for a very moreish snack. Ginny, Richard and Ian at Pimhill Organic make our muesli, porridge and oatcakes. Their family bought the farm in Shrewsbury in 1923. They’ve now got a dairy herd of 220 cows and also grow wheat and oats. During the 1980s Richard and Ginny decided not to take the mill down the supermarket route and downsized, instead supplying mainly to local shops and bakeries. 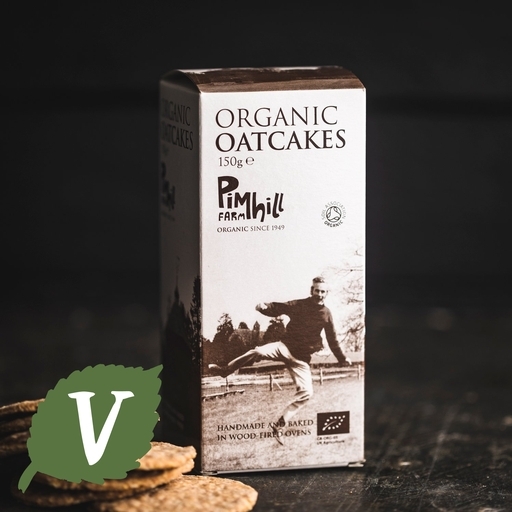 Pimhill are farming pioneers – they were the first organic mill in the country and also made the first organic muesli in the UK. They have barely changed their traditional methods for making organic flours and oats since they started nearly 60 years ago. Wholemeal wheat flour, water*, unsalted butter (milk), medium oats, pinhead oats, groats, salt*, baking powder*.